After 2002, Bennett College endured a few transition years, resulting in the abandonment of the National African-American Women’s Leadership Institute. However, in 2008, the 15th president of Bennett College, Dr. Julianne Malveaux, made leadership a central focus for the institution when she announced it as one of the College’s four foci. Dr. Malveaux also highlighted leadership at Bennett College during her inauguration in 2008 when a women’s leadership conference became a central feature of the historic event. 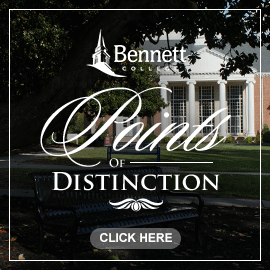 Additionally, in July 2009, under the leadership of Dr. Malveaux, members of Bennett College’s Presidential Cabinet engaged in discussions of the key components of leadership development that should be hallmarks of Bennett students. The outcomes of these discussions defined these components of student leadership development. Student leadership at Bennett College would (a) have an academic focus, (b) be led by women, (c) be developed in a familial, nurturing environment conducive to producing leaders, (d) have a spiritual foundation, (e) have a community commitment, (f) have role models and mentors for students, faculty and staff, and (g) employ best practices for leadership development. The core essence of the initiative would be “The Academic Institution for Multicultural Women Leaders”. The target audiences included students foremost, then faculty and staff, alumnae, community organizations, and academicians. A Leadership Development Institute was envisioned with external support and the advice of an advisory board of local, national and international leaders. The Institute would provide a leadership development training program grounded in research, and providing workshops and experiential learning from women not only from Bennett College but from throughout North Carolina and the world. The vision also included the development of a Leadership co-curriculum. Consequently, in fall 2010, Dr. Malveaux and her team applied to Andrew W. Mellon Foundation for a $99,000 Leadership Planning Grant. The Andrew W. Mellon Foundation approved the grant proposal in December 2010. Dr. Rosalind Fuse-Hall became the 17th president of Bennett College on July 1, 2012. She immediately expressed an interest in building on the Leadership initiative. President Fuse-Hall’s vision is for leadership to become an intentional and integrated aspect of the College, from communications and interactions with prospective students and alumnae to the hiring, training and ongoing professional development of all employees and, of course, in the professional and personal lives of students. During Dr. Fuse-Hall’s tenure, funding has been provided to support leadership training for faculty and staff and an Honors College has been established with a major focus on leadership. Specifically, over a half dozen leadership courses have been developed and approved for students in the Honors College. The courses are designed to hone their leadership skills.